The 58-year-old Fenton spent the last 12 seasons as assistant GM for the Predators. He helped David Poile, the winningest general manager in NHL history, shape the roster that reached the Stanley Cup Final last year and won the Presidents' Trophy with the best regular-season record for 2017-18. 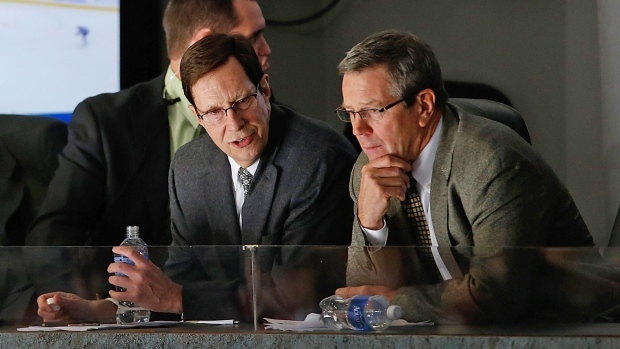 Wild owner Craig Leipold, who once owned the Predators, filled the vacancy created last month when he declined to renew Chuck Fletcher's contract. "Paul is uniquely suited for this job having played 10 years of professional hockey and holding 25 years of management experience in the NHL," Leipold said in a statement distributed by the Wild. "His gift of evaluating talent is obvious in Nashville's roster and recent success. My relationship with Paul goes back to my early days in Nashville, and I know that Wild hockey fans are going to love Paul's infectious passion for the game and unsurpassed work ethic. He's the right person to deliver a Stanley Cup to the State of Hockey." Fenton, who will be introduced at a news conference Tuesday at Xcel Energy Center, becomes only the third general manager in the franchise's 18-year history with a multiyear contract. Leipold considered Fenton for the position nine years ago before hiring Fletcher. The Predators used 17 players they had drafted to win the Western Conference in 2016-17 for the first time in franchise history. Fenton was director of player personnel for the Predators during the expansion club's first eight seasons, until a promotion in 2006 to replace Ray Shero as second in command under Poile. Shero, now the general manager of the New Jersey Devils, left to become GM of the Pittsburgh Penguins, who won the Stanley Cup in 2009. Leipold, who has seen just two playoff series wins by the Wild over 10 full seasons under his control, said last month he needed a "fresh set of eyes" on a roster anchored by centre Mikko Koivu, left wing Zach Parise and defenceman Ryan Suter. The organizational assets are far from bare for Fenton, with recent high draft picks Joel Eriksson Ek, Luke Kunin and Jordan Greenway carrying the potential to form a franchise-leading young core and top-six forwards Mikael Granlund and Nino Niederreiter still in their prime. The Central Division is stacked, though, so progress won't come easy, whether immediate or in the future. The Predators and Jets had the top two records in the NHL during the regular season. An aggressive approach to trades could be the best avenue for improvement this summer, with right wing Charlie Coyle coming off a regression season. Left wing Jason Zucker and defenceman Matt Dumba will be restricted free agents whose rights could be dealt for greater return. Center Eric Staal, the team's leading scorer with 42 goals, has one year left on a cap-friendly contract and could fetch a significant haul.